Where are your communion offerings going? Kulli Toniste is a missionary with the General Board of Global Ministries of The United Methodist Church serving as assistant professor of biblical studies and theology at the Baltic Methodist Theological Seminary in Tallinn, Estonia. The Baltic seminary needs qualified professors to meet European educational standards. It serves students from eight countries and offers instruction in Estonian, Russian, and English. Estonia is part of the Estonia Provisional Annual Conference of The United Methodist Church that includes districts in Latvia and Lithuania. The church in Estonia was never closed during the years the country was dominated by the Soviet Union, but it was closely controlled under communism. Kulli was born in Estonia and taught on both the college and the seminary level while living in the United States. Her husband, the Rev. Douglas Childress, is also a missionary in Estonia. Kulli became a Christian in Estonia during the period of the Soviet Union’s collapse and was for a time the only Christian in her family. “In 1988, we were able to celebrate Christmas again openly. I was 10 years old when I heard the song ‘Silent Night’ for the first time.” She had found a Bible in a closet, likely belonging to a grandparent, and she found fellow Christians at the Estonian Christian Pentecostal Church. Her family was initially suspicious, especially when, after high school, she attended a Bible college rather than a “proper” university. From the Bible college, she went to Baltic Methodist Theological Seminary, where she earned the equivalent of a Bachelor of Arts degree and worked with mission volunteer groups within Estonia and from outside. She next enrolled in Asbury Theological Seminary, Wilmore, Kentucky, where she received a Master of Arts degree in biblical studies, and where she met her husband. Kulli earned a Doctor of Philosophy (Ph.D.) degree in biblical theology through London School of Theology in the United Kingdom. In the US, she taught at Houghton College, Houghton, New York, and Northeastern Seminary at Roberts Wesleyan College, Rochester, New York. She sees God’s hand in developments and hopes that God will use her to help educate future pastors and laity in Estonia. She wants to see theological education in Estonia flourishing and answering the needs of today’s church. Above all, she wants to follow Christ and put her credentials and talents to work for the benefit of the Estonian Christians that once nourished her faith. Kulli and Douglas have three small children, Karl Robert, born in 2008; Kristofer Martin, 2010; and Kalev Douglas, 2012. It has been awhile since our last newsletter. The sunny warmth of summer has turned into the cold dampness and deep northern darkness of winter! We welcome the advent. Darkness is overturned when the One True Light enters the world. Baby Jesus in a manger. Seminary's Christmas play set. In August, Kulli began here tenure as rector/president of the Baltic Methodist Theological Seminary. As the semester began, over twenty new students were greeted hailing from Ukraine, Russia, Finland, Ghana, Nigeria, the United States, and, of course, Estonia. Our kids also began a new year at school. Kristofer began first grade and his teacher tells us he is doing well. It is amazing how energized he is to go to school and is excited to learn his lessons. His Estonian is not perfect, but he pushes himself to learn! Karl is now in the fourth grade (Estonian schools start children one year later than American schools) and is doing well. He continues to be very active in Estonian dance and cannot get enough of building projects with Legos and Minecraft. Kalev started his final year of kindergarden. He has continued to practice Judo which is popular among young children in Estonia. 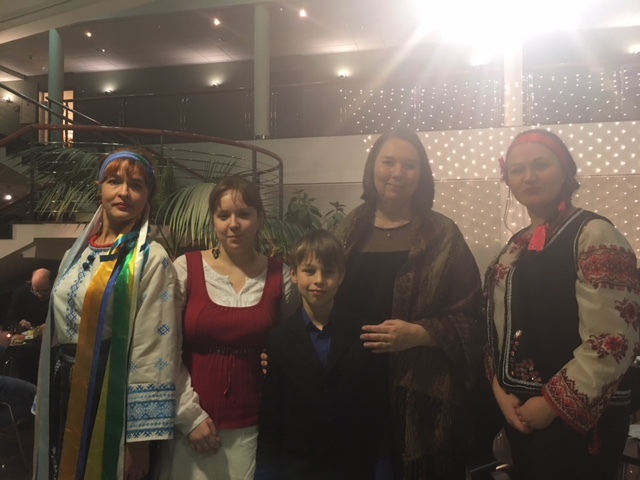 Kulli with some of her 2nd year theology students: Olga, Julia and Viktoria are wearing Ukrainian festive clothing and our son Kristofer at seminary Christmas party. In September, Kulli organized and Doug taught at a preaching seminar for the Methodist preachers and students preparing for pastoral ministry. The event was well attended with 44 participants. 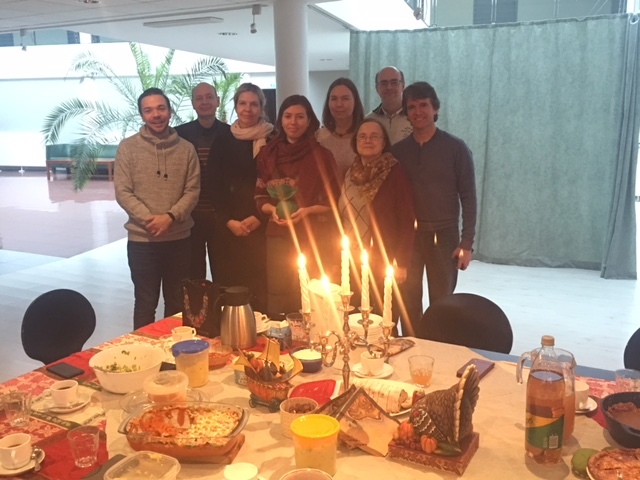 The theme of the seminar was What Would Wesley Preach in honor of the recent publishing of John Wesley’s Standard 52 Sermons into Estonian for the first time. Doug researched and did a presentation on early Methodist preaching and also preached a contemporary sermon based on Wesley’s sermon on The Marks of the New Birth. The seminar has a follow up where pastors get to present their sermons. It is hoped other ministers will also choose one of Wesley’s sermons and write a contemporary sermon based on its content and that we hope to publish these new messages for the greater Estonian UMC. In October, we traveled to Berlin for a gathering of GBGM missionaries from around all Europe. There we were able to connect with other people serving in Europe and share our challenges and experiences as well as learn about how GBGM is preparing to lead in the future. In November, we celebrated American Thanksgiving with some faculty and staff at the seminary. Doug shared various recipes with faculty members who all contributed to the feast. It was a good time of bonding and giving thanks for a busy but productive year together. We are thankful for our talented and dedicated coworkers. In December, the fall semester came to a close. We marked the semesters end with a Christmas party with students, faculty and staff. 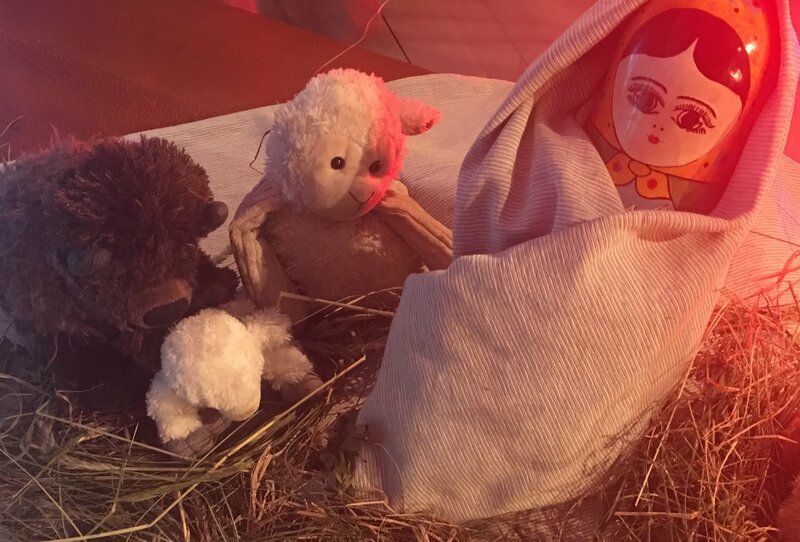 Celebration included food, games, singing, and a drama involving the Wise Men's visit to the baby in manger acted by faculty/staff! Kulli thanked the students for a great semester sharing with them that part of her job as rector is to inspire the students, however, they were the ones who inspired her! The students definitely are amazing. 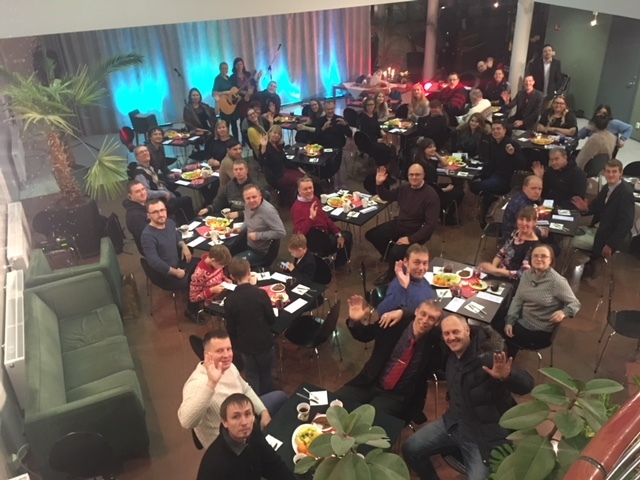 One of the leading ministers in Estonia whom was visiting the student chapel commented that the worship andstudents had “the smell of real faith”. We see and feel this too. It is a curious, active and spectacular group of students! This is a sketch of what we have been up to (aside from our usual duties of teaching, English Speaking ministry, etc.) since last time we wrote. We thank you for your prayers, your gifts, and your good will. The Advent wreath began in the time of the Protestant reformer Martin Luther. During each Sunday of the Advent season, we focus on one of the four virtues Jesus brings us: (1) Hope, (2) Love, (3) Joy and (4) Peace. Others consider the lighting of the first candle to symbolize expectation. The Christ candle is lit on Christmas Eve & Christmas day, reminding Christians that Jesus is the light of the world. The order and exact wording vary among churches, but the wreath continually reminds us of whom we are called to be as followers of Jesus each and every day, as the circle is unbroken in symbolism.